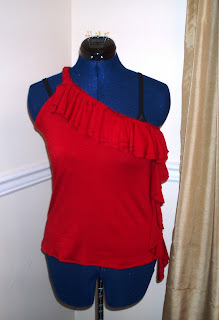 Pattern Description: Trendy knit tops in three variations. I chose view C with the front and side flounces. Pattern Sizing: 4-20. I made a size 12. Did it look like the photo/drawing on the pattern envelope once you were done sewing? Yes! Were the instructions easy to follow? The instructions were easy, and the top was super simple to put together. not to like about this pattern? It’s super cute and trendy, perfect for a night out dancing or on the town. 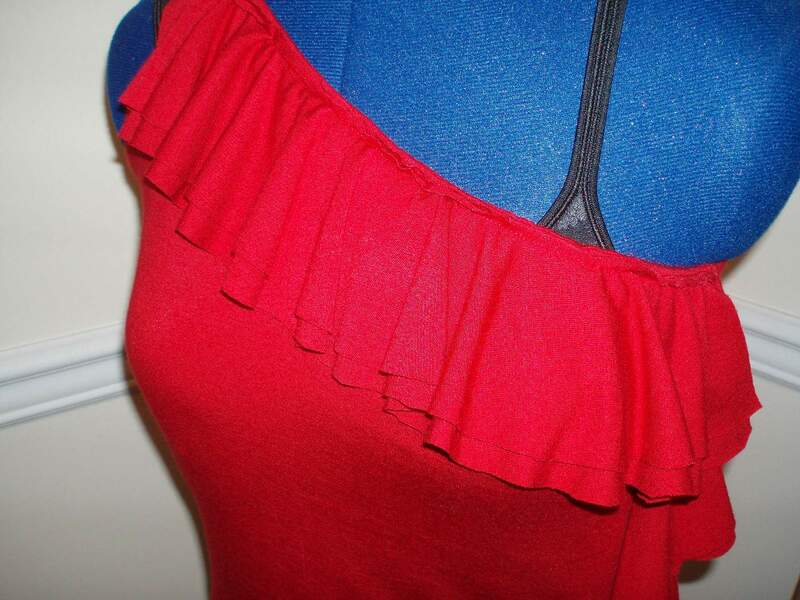 The wearing ease is perfect, the elastic around the back keeps the top fitted quite snuggly to the body. There is no need to fear falling out of this top or exposing “the girls.” The only gripe I have abotu this pattern is that it’s not quite long enough for my tastes, and the strap was a bit on the short side. But these aspects of the pattern are easy to modify. 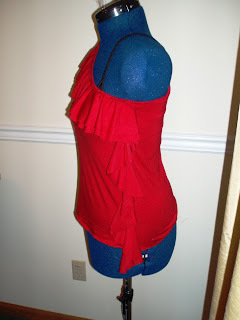 Pattern alterations or any design changes you made: I did not make any this time, but when I make this again in hot pink, I will add 2-3 inches to the straps, lengthen the hem, and lengthen the facing by an inch. Would you sew it again? Would you recommend it to others? I would highly recommend this to others. I would just warn you about the short strap and advise you to lengthen it so that you have enough to work with the make the appropriate adjustments for your body and comfort. Fortunately, in this case, my fabric's right and wrong sides looked about the same. 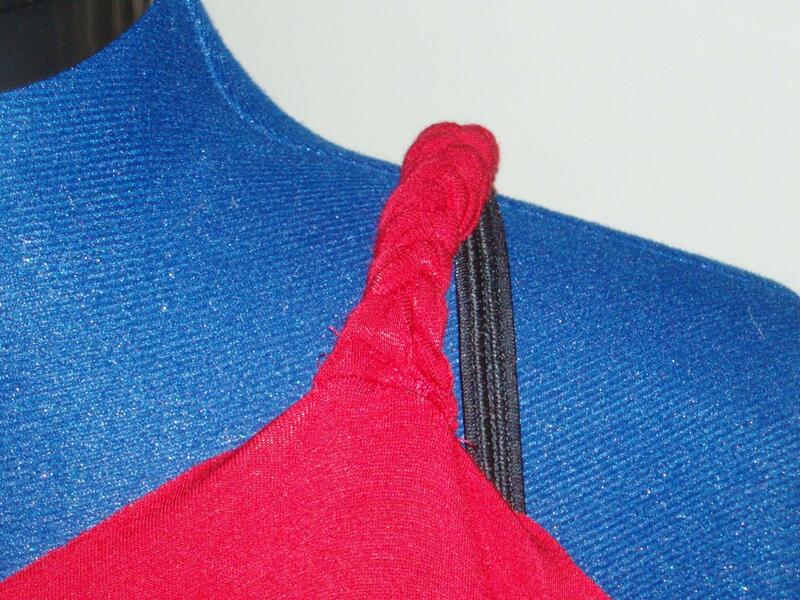 Yes, I think folding the strips length-wise might help minimized the chance of the wrong side showing. Or another idea might be it sew the strips right sides together and turning it inside out so that you have a tube. Then the wrong side will have no chance of showing. I hope it works out for you! Do you have any hints for the braid? I am using fabric with a good and bad side and I can see the bad side when I braid. Did you fold the strips width wise when you braided? The directions and watching "Suede's" video do not seem to match. Super cute top! I saw this pattern and said no but after seeing yours all made up I like it. You'll certainly draw attention in this top. Very nicely done. Beatiful job! I can so see you doing a salsa in that sassy little number! SUPER cute top! I hadn't noticed this pattern before. Thanks for shining the spotlight on this one. Your version is great!